Putt, swing, ping…the gang’s all here! In addition to the new homeowners, we have more than 50 homes under construction and six move-in ready homes ready for someone just like you. See for yourself! October 21 – Sneak onto the course for the first opportunity to practice your game at the VIP golf event! Tee up on holes 9, 10 and 18 and practice your putting skills on the short game practice area. The driving range will be open for regular events this fall. Spring 2018 – The Kissing Tree Golf Club, on-site restaurant, Tarbox and Brown, and indoor pool will officially open. 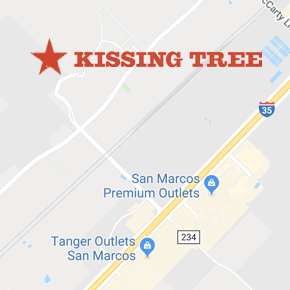 Follow us on Facebook for weekly updates, and be sure to join us for weekly social events at KT and around the San Marcos community with Lifestyle Director Kevin Wilson.